Hei, pieni piruetti perjantaille, iloinen Penny leima, omatekoiset harsolumikukat koristeena. Ja nyt tanssiaskelin pakkaamaan huomiseen askartelutapaamiseen Riihimäelle. Hi, Happy Friday with this cute cat, a Penny Black stamp; coloured with ProMarkers. 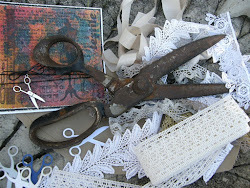 Frosty gauze flowers (home made) and a feather die cut (free from magazine). Corner is Lea'bilities die cut. Such a cute image! Lovely design and colours, thanks for joining the Southern Girls! I adore Penny Black stamps, they always make me smile and this lovely card is no exception! Thank you for joining in my Alphabet challenge at PFP and good luck! 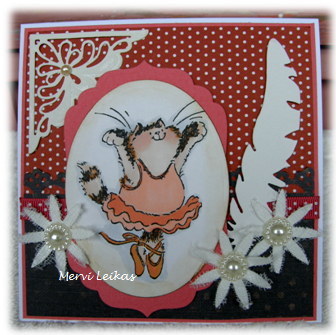 Gorgeous card Mervi! Super cute and I love the colours you've used. A fabulous card! This is one of my favourite Penny Black stamps!